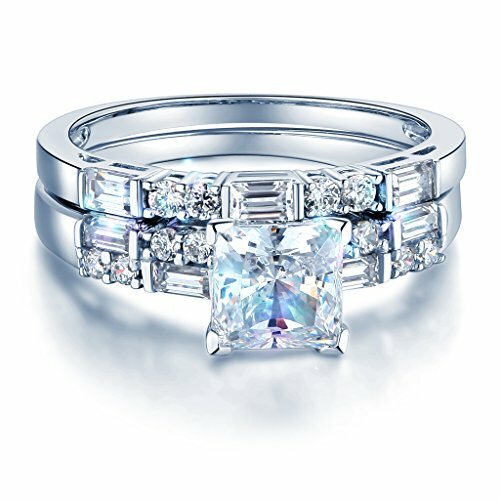 Wellingsale Ladies Solid 14k White Gold Polished CZ Cubic Zirconia Princess Cut Engagement Ring and Wedding Band, 2 Piece Matching Bridal Set - Size 6.5 by Wellingsale® at SCRHI. MPN: SFP-J-LGDI-RG-00715-0716-065. Hurry! Limited time offer. Offer valid only while supplies last. WELLINGSALE® Features:1. Stunning High Polished Finish2. Made using only the most premium and pure materials3. Non tarnish, Stunning Color4. - Other: . . AAA Grade Cubic Zirconia. This item is available to purchase as a single Engagement Ring or Wedding Band. Please browse our catalog!.